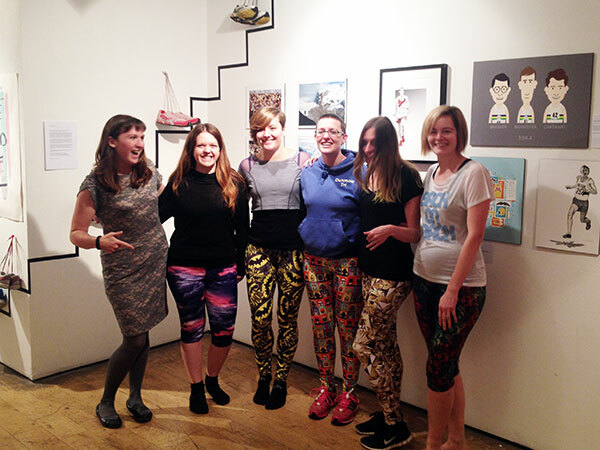 Cult running magazine Like the Wind approached me a few months ago to ask if I’d like to run a “sew your own leggings workshop” at the week-long popup they were throwing together at the end of October. I’d known one half of the husband-and-wife team that run the magazine, but I’d never met Julie before this. Once I found out that she not only owns her own overlocker, but bought it when she sewed her own wedding dress with it(! ), I knew we’d get along just fine. 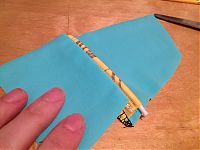 We had five runners who’d only done a small amount of sewing before, but had never touched an overlocker before, and certainly not a coverstitch either! They each picked their own fabric from FunkFabrics’ range, and walked home in some very stylish leggings at the end of the afternoon! 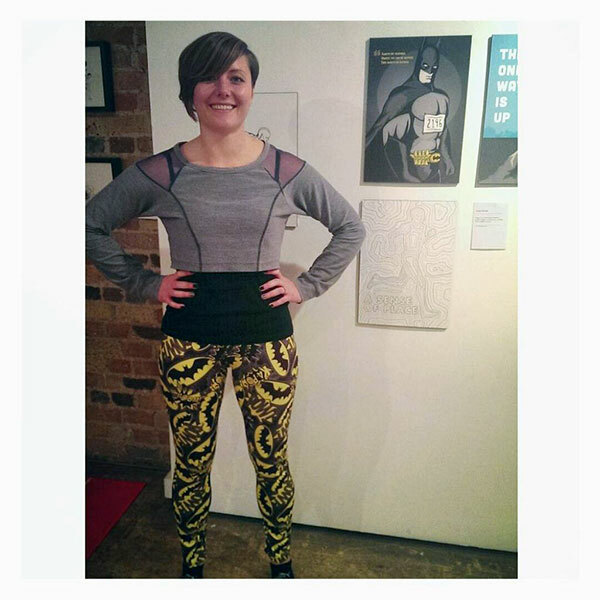 Georgina picked a “Gotham” print, so of course she just had to pose with the Batman art in the gallery! And here’s the finished set! I saw quite a few little “omg I’m so happy in my leggings” dances at the end, which really reminds me why I love teaching so much. Lucy posted a great writeup of the street art tour and my class, too. 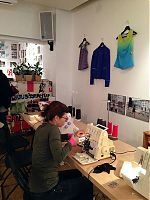 There may be another Like the Wind workshop in the new year if we can work out the logistics, but there will definitely be more up at the Thriftystitcher studio in January and February, to be announced very soon! The classes are very similar, so if you’re a runner you can come learn at Thriftystitcher, or non-runners vice-versa at Like the Wind. 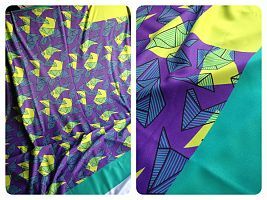 But I was so jealous of all their finished leggings that I treated myself to some Funkifabrics lycra this week (it was difficult, but I settled on this geometric aqua number in the end, because it reminded me of a Lamb album cover!). When I was pulling out supplies to bring along to the workshop, I came across pieces for this sweatshirt that I’d cut out in February when I was trying to deplete random bits of leftover sweatshirting that was taking up too much room in my little sewing cave. The lavender “sacrificial sweatshirt” came out of that same cull, but for some reason I never quite got around to sewing this blue one together at the time. It’s a testament to the tidyness of my tiny sewing cave that I still have all the pieces, really, and I’ve made this pattern (from the November 2006 Burda magazine) so many times (8? 9?) that I don’t need to dig out the instructions. This really did come together in a morning, and it’s perfect for this weather, now, too. Spoonflower had a free shipping day back in October, and I couldn’t resist another yard of my fabric collaboration with illustrator Laurie King! My next pattern – male testers needed! UPDATE: wow, thanks guys! I’ve got enough testers now! I’m not yet in a position to give away too many details about my next pattern (sorry!) but it’s going very well, and is ready to be graded, and after that, the testing! Yay! What I can say is that this design will be released for both men and women – two different drafts – not one “unisex” one that fits no one well, bleurgh! I’ve got plenty of fit lady testers, but I could really use some more male testers! What this means is that I need either men who sew and exercise regularly, or women who sew with a man if their life who exercises regularly. 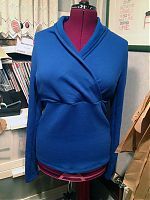 You’ll need to have had some experience sewing stretch fabrics, and will need to be able to sew a sample and give feedback within two weeks (I always give you at least two weekends included in the turnaround time). You don’t need to have a blog! 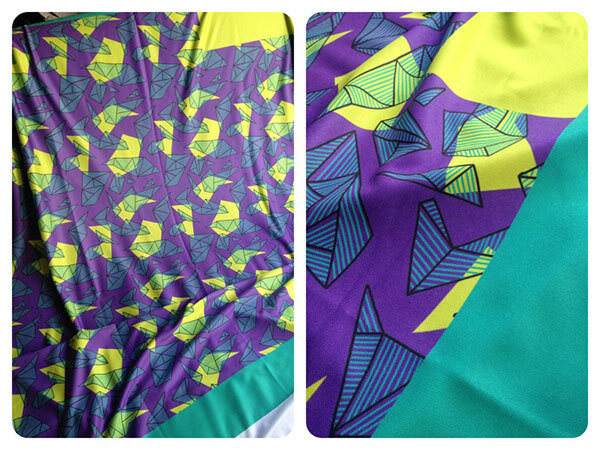 In return, you’ll get a chance to test the pattern early, plus a finished (and updated!) copy at the end. If this sounds like something you’d like to do, please leave a comment and I’ll get in touch. For this particular pattern, men who cycle, run, ski or surf are ideal. I can’t share my tech drawing yet, but I did stumble across this unlikely colour combo when I was pulling out fabrics for my next sample! How much do I love this aqua and yellow combo?! 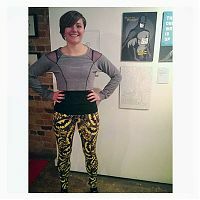 You may recognise the yellow from my gold medal leggings – I’d cut up the leftovers into strips for coverstitch binding, but they’re also perfect for stretch piping! And finally, after way too much Work Sewing, I’ve cut out some Fun Sewing projects for me. 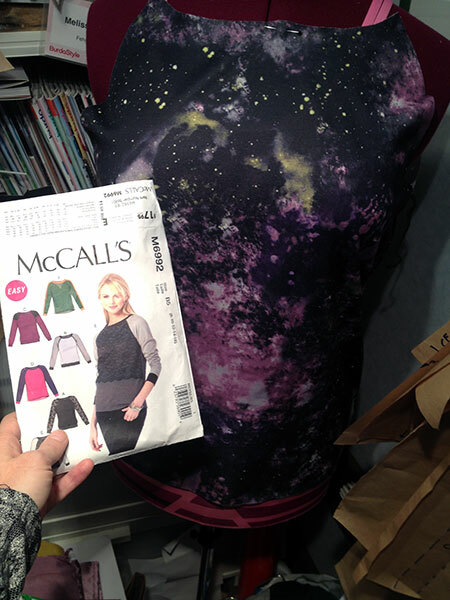 First up is a “statement sweatshirt” using some leftover galaxy print ponte from my birthday dress. I don’t usually sew from Big Four patterns as they’re so freaking expensive here, but in order to get the cheapest price on the Kwik Sew leggings pattern for the Like the Wind workshop, I had to become a Sew Today member, which came with my choice of two free patterns. 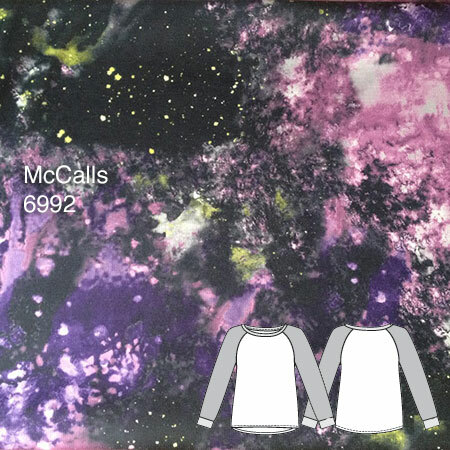 One of which was McCalls 6992. I could’ve easily drafted it myself, but I thought it might feel too much like work, so I grabbed this instead, and since it was free and I was feeling supremely lazy, I actually (gasp!) cut the pattern tissue instead of tracing it. Eep. I also chose McCalls 7026 at the same time, so I’m going to try and graft the thumb-hole cuffs onto this at the same time. I decided to use some black scuba from Tia Knight for the contrast raglan sleeves, but I’ve also been thinking recently that I really need a basic black skirt. 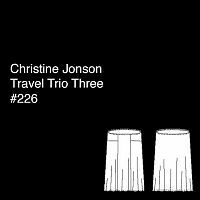 My Colette Beignet skirt looked fine in the photoshoot last week, but it’s really too big in the waist now. 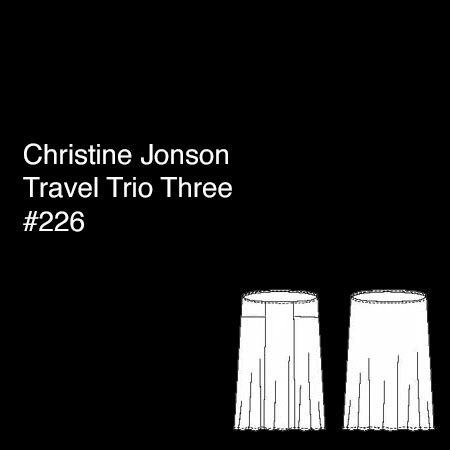 What I decided I really wanted was another of Christine Jonson’s Travel Trio Three skirt, as I wear the blue one I made last year all the time, and I consistently get compliments on how thin I look every time I wear it (bonus!). Since the pattern is already traced out and within easy access, I should be able to sew both this skirt and the sweatshirt in the same weekend. Fingers crossed I can squeeze in a trail run, a 40th birthday party, and a photoshoot into my “free weekend”, too. Separator image Posted in In Progress and tagged with christine-jonson, class, exercise, mccalls.